Fabiano Caruana's outstanding victory at the Dortmund tournament, a U.S. rating record and a magnificent king's hunt by the Chinese wizard Wei Yi marked the first days of summer. 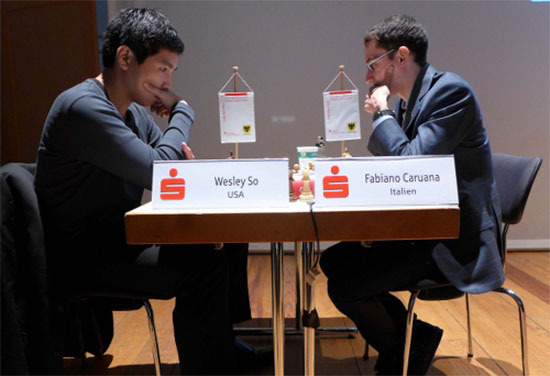 Caruana became eligible to play for the United States just before the start of the traditional tournament in Dortmund, Germany. It caught the organizers by surprise since they still had him listed as playing for Italy. The top three favorites -- Caruana, Wesley So and the former world champion Vladimir Kramnik of Russia -- lost early. Caruana recovered in his true style, winning his last five games. So defeated Kramnik in the last round, taking second place on a tie-break. This year marks the first time in 41 years when the United States has two or more players rated in the Top Ten on the FIDE list. In 1974, Bobby Fischer was rated first with a 2780 rating, I was number 10 with a 2625 rating. FIDE doesn't publish ratings from the last century anymore. Before the tournament in Dortmund ended, FIDE published the July rating list. Nakamura, Caruana and So broke a new record: the U.S. now has three players in the Top Ten. Caruana finished in Dortmund in elegant style against Liviu-Dieter Nisipeanu and was able to leap 1.5 points ahead of his next rival, an incredible accomplishment in such a short event. White threatens 28.Nd4, but Caruana does not blink. He foresees the beautiful finish and sends his a-pawn to do the damage. After 28.Be7 a4 29.Nd4 Nb6 30.Nxc6 Nxd7 31.Nd4 Bb6 the a-pawn is a menace and black should win. The point. To stop the pawn, White has to lose material. After 30.Na7 b2 31.Rd1 Bf4 32.Rb1 Bc1 33.Nb5 Nd2 wins. Fabiano defends his pawn on b7 and White can't catch the b3 pawn. After the game Caruana tweeted: "That was my Ortueta-Sanz. Thrilled to be the winner of Dortmund for the 3 rd time!" He was referring to a beautiful promotional combination apparently played in the game Ortueta-Sanz in Madrid in 1933. But another game was published in Dziennik Poznanski in 1953. After a long research, the Dutch writer Tim Krabbé believed that the game Tylkowski-Wojciechowski, supposedly played in Poznan in 1931 was the original. 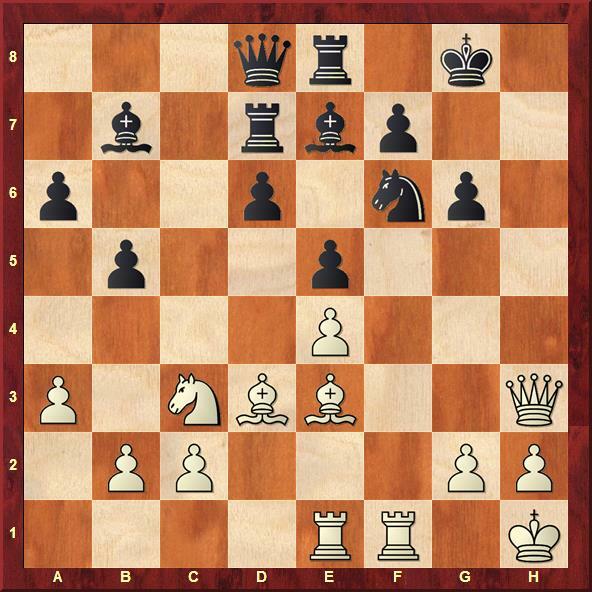 In his excellent book The Art of the Endgame, My Journeys in the Magical World of Endgame Studies, published by New In Chess in 2011, the Dutch grandmaster Jan Timman has his doubts and criticizes the moves of the Polish game. The combination appeared in many forms and modifications ever since. A Czech chess historian made the latest discovery last year. Jan Kalendovsky found this game in the German daily Tagesbote, published in Brno on April 14, 1934. At that time, the Swedish master Ored Karlin took part in a small tournament in the Moravian city and told a story about his journey through Spain in 1933, where he played the game. The combination is also known as Ortueta-Sanz, Madrid 1933 or as Tylkowski-Wojciechowski, Poznan 1931. 1... Rxb2! 2.Nxb2 c3 3.Rxb6! After 3.Nd3 c4+ 4.Rxb6 cxd3 5.Rc6 d2 wins. The beautiful point of the combination. 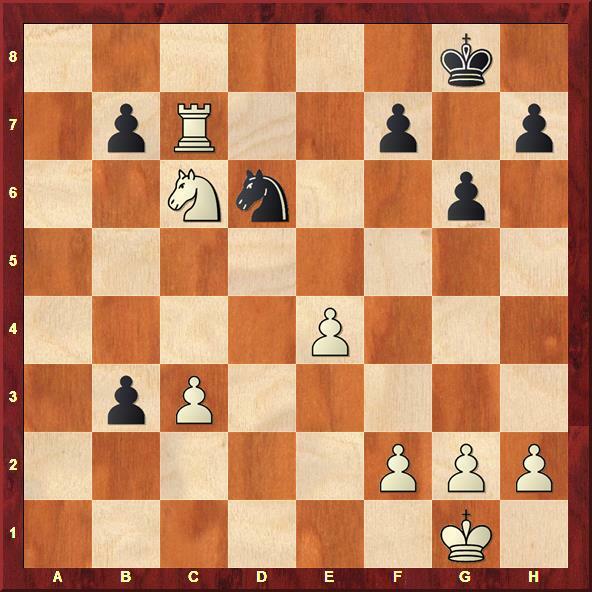 The rook is overworked, for example 5.Rb8 c2 wins; or 5.Rxc4 cxb2 and the b-pawn promotes. We will probably never know who played or composed this combination and in what year. It remains one of the eternal chess puzzles. Could Karlin's story be the first published article about the famous combination, Kalendovsky wonders. The Ortueta-Sanz game also ends with the same idea. The decisive move a7-a5 comes at the end. Caruana played it at the beginning of his combination. It is always encouraging to see young players being inspired by the past. At the 1978 Buenos Aires Olympiad China played for the first time and Liu Wenzhe created the Chinese Immortal Game, defeating the Dutch grandmaster Jan Hein Donner in mere 20 moves with a splendid queen sacrifice. 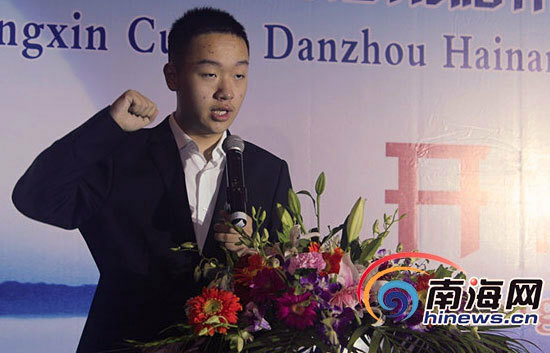 But that performance is hardly comparable to an astonishing game played by the 16-year-old Chinese rising star Wei Yi at the tournament in Danzhou. 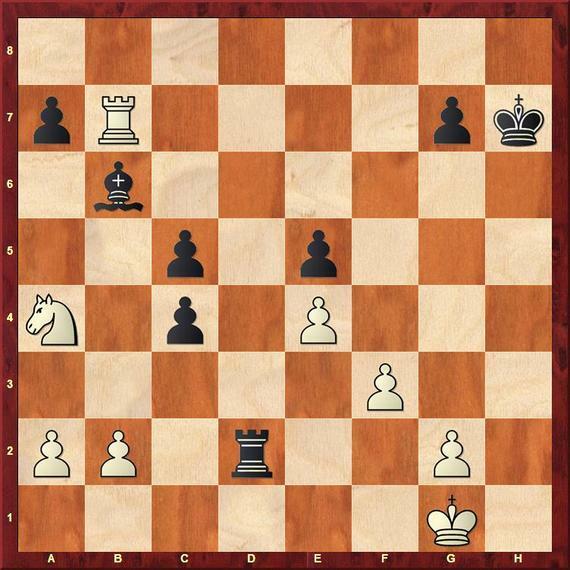 I had a feeling of deja vu: the knight leaps to the center of the board, a rook is sacrificed, the black king is chased and a quiet move seals the victory. Have I seen it before? I realized that I played a mild version of Wei's game at the age of 15 in the semifinal of the Czechoslovakian championship in 1958. 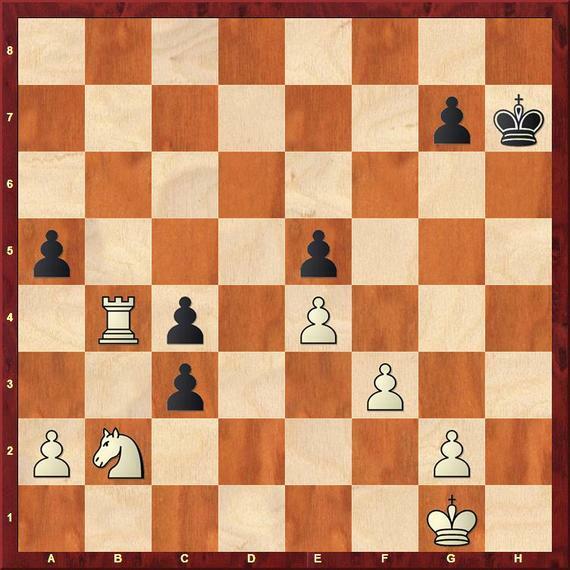 In comparison to Wei's game, the position of the black king is more compromised. The attack is easier to perform. An opening salvo, clearing the diagonal b1-h7. 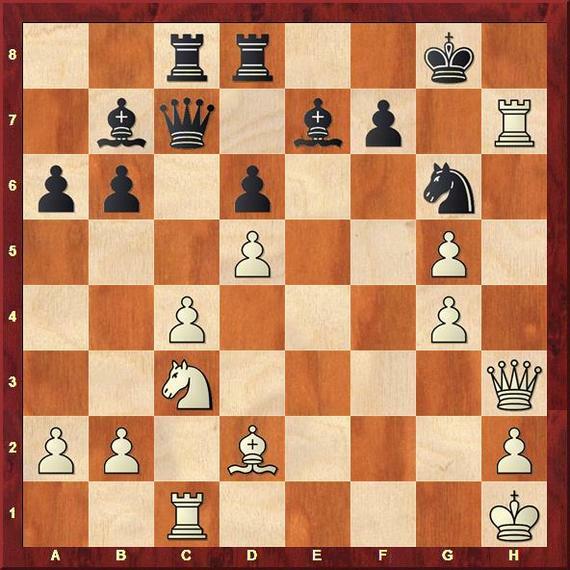 I decided to keep the knight, but 20.Nxd5 was playable, for example 20... Bxd5 21.exd5 Nf8 22.Qe1 Ng6 23.Bxg6 hxg6 (23... fxg6 24.Qe6+) 24.Qh4 and White wins. Having in mind to attack the pawn on f7 with 22.Rf1. Black wants to defend it with the knight from the square e5. Timing is everything. The double bishop/rook sacrifice flushes the black king out. After 22... Kg7 23.Re1! Ne5 24.Rxe5! dxe5 25.g6 Nxg6 26.Bh6+ Kh8 27.Bxg6 fxg6 28.Qf7 wins. The rook can't be taken: 23... Kxh7 24.Qxf7+ Kh8 25.g6 wins. The rook sacrifice is simpler than in Wei's game. On 25... Nf8 26.g6 wins, for example 26... Qxc4 27.Rxf8+! and White mates. After 28... Ke8 29.g6 black cannot stop 30.g7, for example 29... Qxc4 30.Re1 Rc7 31.g7 wins. Wei's king's hunt is much longer and more difficult to calculate. B) 22... Rf8 23.Bh6 Nh7 (23... Nxd5 24.Bxg6!) 24.Bxf8 Bxf8 25.a4 Black is simply an exchange down. C) 22... Rb7 23.Qf3 Kg7 (23... Kh8 24.g4 is unpleasant for Black.) 24.g4 Rf8 25.g5 with White's advantage. At worst, the rook sacrifice leads to a draw by perpetual checks. The Chinese kid was obviously looking for more: chasing the king all over the board. After 22... Bh4 23.Rxd7 wins. Drawing the king to the middle. 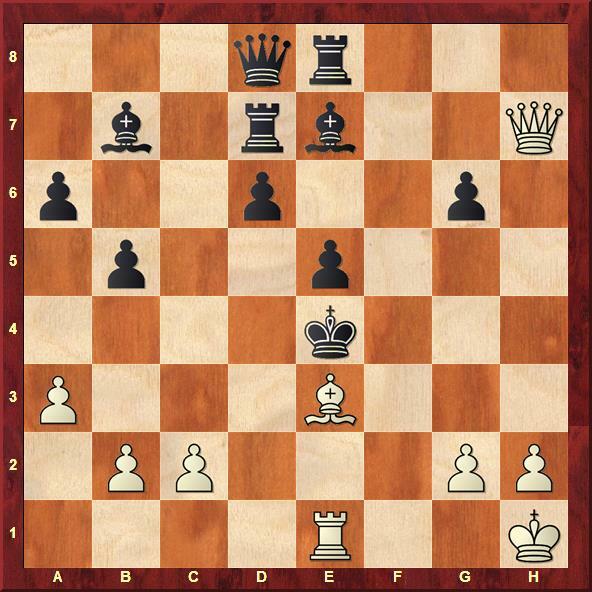 24.Qh3+ Kf7 25.Qh7+ Ke6 26.Qh3+ is only a draw. After 24... Bxd5 25.Bxg6 Rf8 26.Qh3+ Kf6 27.Rf1+ Kxg6 28.Qh6 mates. 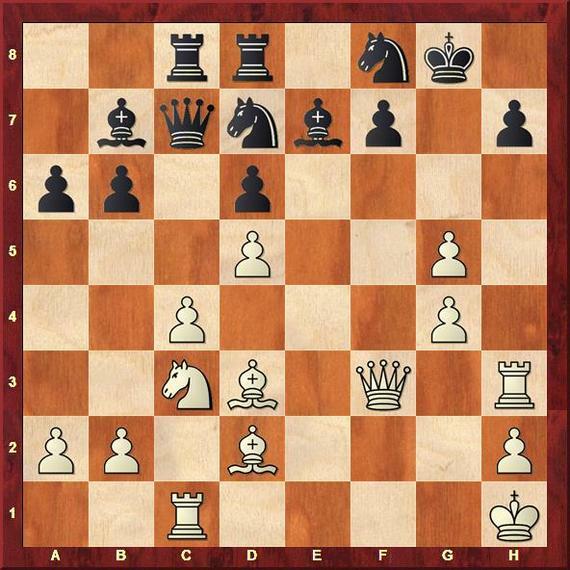 The bishop sacrifice does not allow the black king to escape via the square c6. A human reaction, tying the noose around the black king and threatening 27.Qf3 mate. 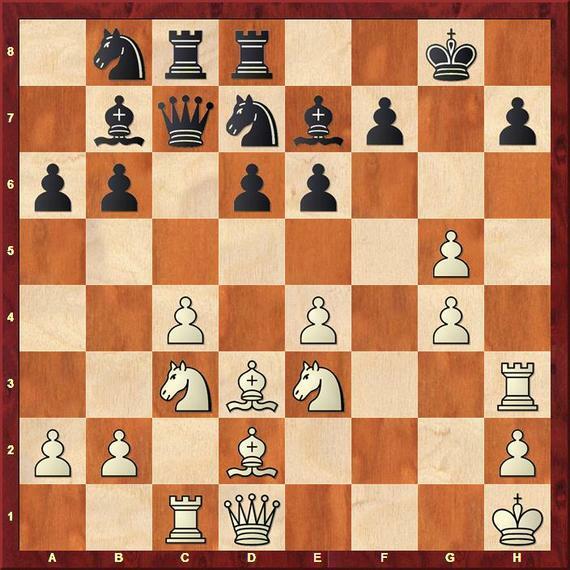 A) 27... Kxc4 28.Rc1+ Kd5 (28... Kb3 29.Qc2+ Ka2 30.b3+ Kxa3 31.Ra1+ Kb4 32.Bd2#) 29.Rd1+ Kc6 30.Qc2 mate. B) 27... Be4 28.Rd1+ Kc2 29.Qxe4+ Kb3 (29... Kxd1 30.Qd3+ Ke1 31.Qd2+ Kf1 32.Qd1#) 30.Qd3+ Ka2 (30... Ka4 31.Qc2+ Ka5 32.b4#) 31.b4 Rf8 32.Qb1+ Kxa3 33.Rd3+ Ka4 34.Qb3 mate. After showing he has a draw at hand, Wei goes for the execution. Threatening 30.Qd3 mate forces the black king to run to the kingside. 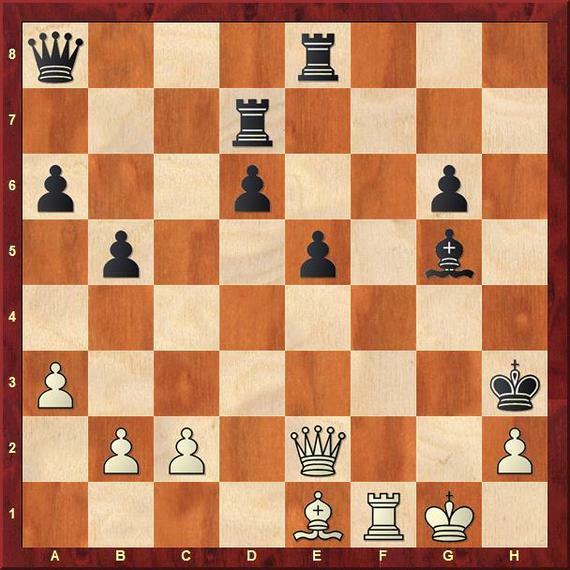 Bringing the queen closer and attacking the pawn on g6. A desperation, but there is not much left. For example, 31... Rg7 32.h3+ Kh4 33.Qe2 Qd7 34.Kh2 Bxg2 35.Qxg2 Qf5 36.Rxf5 gxf5 37.Qf2+ Kh5 38.Qxf5+ Bg5 39.Bxg5 wins. A) 36... Qa7+ 37.Kh1 Qb7+ 38.Rf3+ Kg4 39.Qg2+ Kh5 40.Rh3+ Bh4 41.Rxh4 mate. B) 36... Bf4 37.Qd3+ Kg4 38.Qxg6+ Bg5 39.h3+ Kxh3 40.Qf5 mate. The skeptics may argue Wei overlooked a mate in nine moves as suggested by many computers, but even they would have to admit that the Chinese wizard worked out the king's hunt brilliantly. 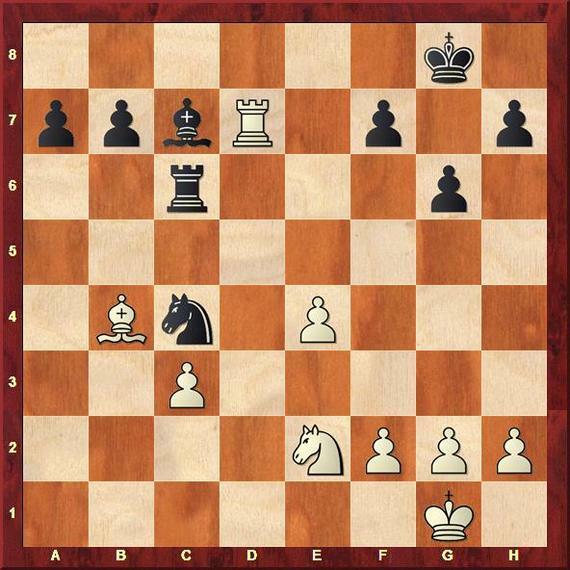 Even Garry Kasparov overlooked a more efficient and sparkling finish in the most spectacular game of his career against Veselin Topalov in Wijk aan Zee in 1999. But with a slight detour of his king's hunt, Garry added an extra dimension to the game and enriched the chess world with an unusual masterpiece.